Traditionally, when the sun is in Taurus—the sign of the builders—and the moon is full in Scorpio, Buddhist communities throughout the world commemorate the birth, enlightenment, and parinirvana (final nirvana) of the Buddha. This celebration, known as Wesak, derives its name from the month in the Indian lunar calendar in which it occurs—Wesak or Vesak (Sinhalese), from the Sanskrit Vaisakha. 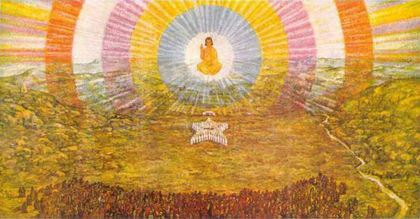 On this date, disciples and bodhisattvas, angels and elementals gather in a valley in the Himalayas to receive the benediction of Lord Gautama, as he addresses his disciples throughout the world, contacting them on the many planes of their evolving consciousness and blessing all life as his flame encompasses the earth. Some say that the Buddha is seen physically by certain adepts and devotees as he brings his “flood of blessing” to the earth. Buddhists celebrate Wesak, the most important festival in the Buddhist world, by meditating on the life and teachings of Lord Gautama, reciting scriptures, fasting, distributing food and money to the monks and the poor, and processioning around Buddhist temples and holy places. It is also the time for the sacrifice of the elements of the lower nature, that the higher nature of God may descend into one’s temple. Most importantly, the day serves as a reminder for Buddhists that like the Compassionate One, they, too, must attain enlightenment. Next to the birthday of Jesus Christ, Wesak is the highest holy day of our Church. During your Wesak service, give “Buddhist Mantras” (number 625) and hymns to Gautama Buddha. Call for the protection of all souls who are to achieve enlightenment and attain union with God in this age. Ask Lord Gautama to help you transcend the lower nature. Play a Wesak address by Gautama Buddha as part of your service. After the dictation, you may wish to serve Buddha's pudding (a rice pudding) to commemorate the rich rice milk served to Gautama Buddha before his meditation under the Bo tree. The rice milk refreshed him so that he was strong enough to receive enlightenment. Read about Wesak, Gautama’s initiations and your own potential to become a Buddha in the messenger’s series “The Message of the Inner Buddha” (Pearls of Wisdom, vol. 32, nos. 28–30). Pearls of Wisdom, vol. 26, no. 19, May 8, 1983. Pearls of Wisdom, vol. 28, no. 25, June 23, 1985. Pearls of Wisdom, vol. 32, no. 28, July 9, 1989. Holy Days Calendar, April 1994. This page was last modified on 14 July 2016, at 17:25.